Who knows where the path might go? I really like Ryuga tools. They are very affordable, extremely high quality and finely made. The stainless or carbon steel is satin-finished and a pleasure to hold and use. 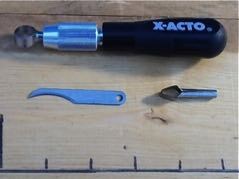 Each tool comes with a zippered storage case. Free shipping via US mail on all Ryuga and Joshua Roth purchases over $25! Item # T20: 1 in stock. Ryuga RC-06s. 8" concave branch cutter. An excellent and necessary tool for all bonsai work. Spring handle with leather strap for closure. Price: $50. Stainless: 2 in stock. $85. Deal! $10 off any tree with purchase! Item # T21: 2 in stock. Ryuga RC-07. 6.5" concave branch cutter. Excellent for smaller hands. Small enough for carry-on. Item # T22: 1 in stock. Ryuga RC-17. 11"giant concave branch cutter. Great for larger branches and trees. Deal! $15 off any tree with purchase! Item # T23: 2 in stock. Ryuga RC-08s. 8" sperical knob cutter. Spherical cut heals quickly with minimal scarring. Spring handle with leather strap for closure. Price: $58. Stainless: 2 in stock. $85. Item # T24: 3 in stock. Ryuga RC-10. 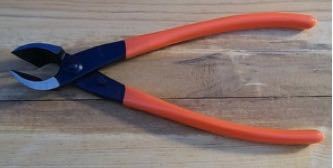 8" bonsai wire cutter. Suitable for all sizes of bonsai wire. Rounded head protects the tree. Item # T25: 0 in stock.FAVORITE! Ryuga RC-11. 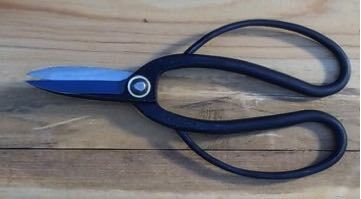 6.9" bonsai wire cutter. Suitable for all sizes of bonsai wire. Rounded head protects the tree. Small enough for carry-on. Price: $45. Stainless: 2 in stock. $70. Item # T27: 1 in stock. Ryuga RC-05. 8" bonsai wire/jin pliers. 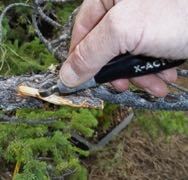 For help applying and removing bonsai wire and peeling wood to create jin. Item # T28: 1 in stock.FAVORITE! Ryuga RC-03. 7.75" bonsai ashinaga shear. 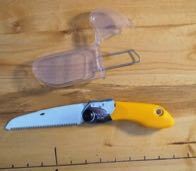 The perfect all around shear for foliage and needle pruning..
Price: $30. Stainless: 3 in stock. $58. Deal! $5 off any tree with purchase! Item # T30: 0 in stock.FAVORITE! Ryuga RC-21. 8.25" bonsai 3 in 1 shear. Very handy! Trim foliage, wire up to 3mm and branches up to 7mm with one tool! Price: $46. Stainless: 0 in stock. $66. Item # T31: 2 in stock. Ryuga RC-04. 7.5" bonsai hasami shear. Slightly heavier blades and bigger handles make this shear useful for light branch and root pruning as well as needle and foliage pruning. Item # T32: 0 in stock. Ryuga RC-01. 7.0" bonsai satsuki shear. A great shear for detailed needle and foliage pruning. Small enough for carry-on. Item # T33: 1 in stock. Ryuga KF-4. Bonsai draw knife. Perfect for removing bark and carving deadwood. Item # T34: 1 in stock. Ryuga KF-3. Carving knife. An all purpose carving knife that you'll use again and again. Item # BA 1: Favorite! There are a lot of great bonsai tools out there, but my favorites are Joshua Roth professional grade tools. Made of the highest quality Japanese carbon steel to last a lifetime. I bought a pair of Joshua Roth concave cutters over 15 years ago and despite lots of hard use they still work perfectly and are my favorite pair. Free shipping via US mail on all Joshua Roth and Ryuga purchases over $25! Item # T10: 0 in stock. JR169 8" Professional grade concave branch cutter. An excellent well-made tool for all bonsai work. Made for removing branches flush with the trunk. Price: $80. Deal! $20 off any tree with purchase! Item # T11: 1 in stock. JR165 8" Professional grade bonsai wire cutter. Rounded head cuts wire without damaging the branch. Easily cuts any size wire. Price: $75. Deal! $15 off any tree with purchase! Item # T13: 1 in stock. 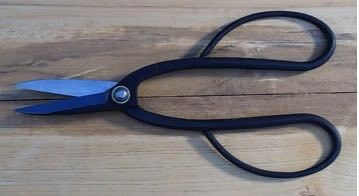 JR1158 8.5" Intermediate grade angled head bonsai/jin pliers. Angled head is especially useful for bonsai work! Item # T14:(below) 1 in stock. JR2168 6.9" angled head pliers. 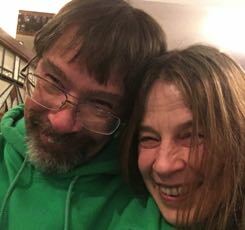 A smaller version. Can travel carry-on. Price: $65. Deal! $10 off any tree with purchase! Item # T15: 2 in stock. 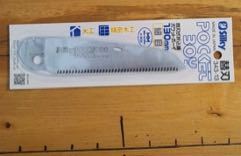 JR163 8" Professional grade ashinaga shear. An excellent shear for foliage trimmimg, pruning and all around use. Super sharp blades. Price: $55. Deal! $10 off any tree with purchase! Item # T16: 1 in stock. JR160 Professional grade hasami shear. Slightly heavier blades make these shears useful for foliage, root and light branch work. Super sharp blades. Item # T18: 1 in stock. JR3500 Cordura Nylon tool roll with Joshua Roth logo. Seven pockets to hold your tools at home or while travelling. Price: $25. Deal! $5 off any tree with purchase! Item # T17: 0 in stock. JR164 7.5" Professional grade Satsuki shears. A great shear for all around needle and foliage pruning.